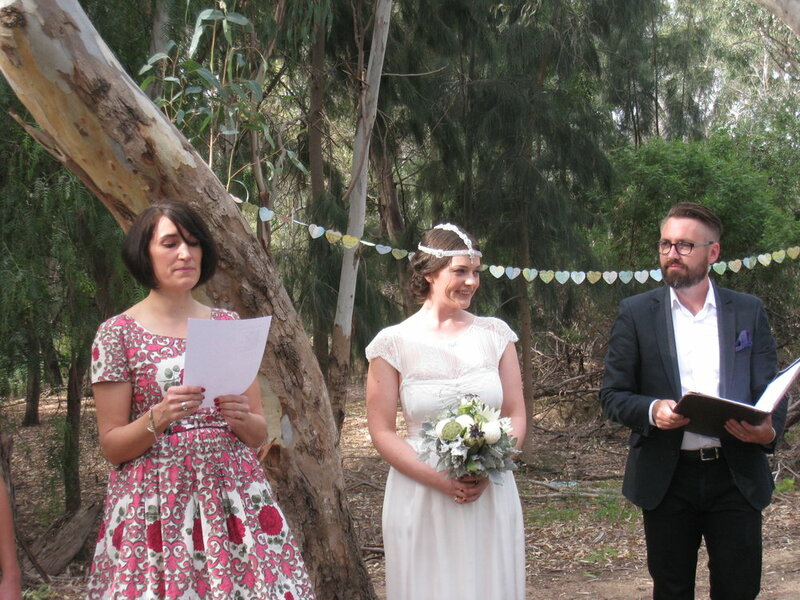 Katie and Ollie are friends of mine, so it was a special pleasure to be part of their wedding as their celebrant! Their ceremony was held under the gumtrees at Tallarook Town Hall. Afterwards everyone had brought a plate to share and their wedding had a great community feel. Anthony was everything we could have hoped for in a celebrant and M.C. He was really organised but very relaxed and made the whole day/evening so easy and fun! Before our wedding, we met with him to run through the plan for the day and it was clear that he is really passionate about what he does. We came away feeling really prepared but most of all, excited!! Throughout the ceremony Anthony was great! He included the special touches we asked for (acknowledgement of traditional owners of the land etc.) respectfully and his genuine warmth and humour really added something special to the ceremony. He had our story down pat as he regaled our guests with our ‘love story’ before proceeding to the nuptials. It was all very, very special. So many of our guests commented on how great Anthony was and we have to agree! If you’re after someone unique for your special day who will guide you through the nerves with humour, who will crack your guests up and who will be confident and cool Anthony is your guy!